The Nonviolent Radical Party Transnational Transparty celebrated Human Rights Day, December 10th, in a pagode at Pusignan, by the city of Lyon, France. 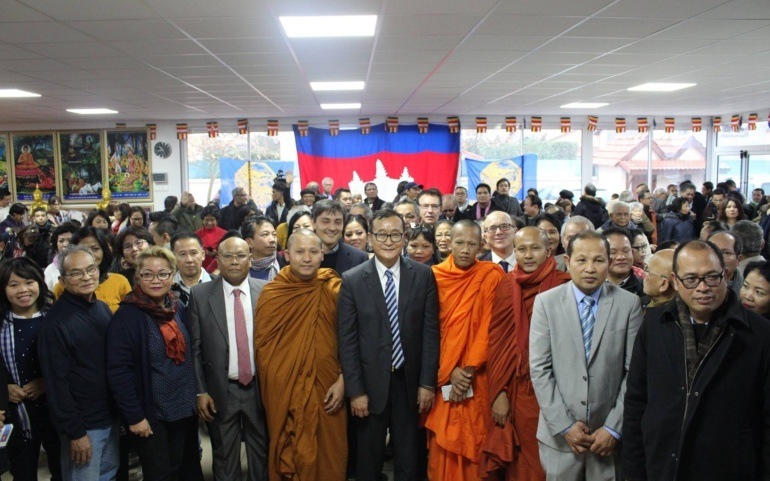 The event was attended by members of the disbanded Cambodian opposition party, Cambodia National Rescue Party (CNRP) and people form the Cambodian community. Some 250 people, including former CNRP leader Rainsy Sam, Saumura Tioulong, Sothavarin Men and French Senator André Gattolin attended the gathering. The first to take the floor was André Gattolin, who spoke as a Senator of LREM, as a member of Radical Party and as a “local guy”, being in fact born a few miles from Pusignan. He reiterated his commitment to the universality of human rights, as the United Nation Charter adopted on 10 December 1948 by the General Assembly and outline his activity as a Senator of the French Republic. According to Rainsy Sam, “André is a friend, an ally, a brother defending democracy in Cambodia. Without him we could not have started important interlocutions”. He then devoted a good part of his speech to give reasons why it is vital to join the Radical Party, taking great care to highlight the three underlying features that make it so unique. Matteo Angioli thanked the Cambodian community for their extraordinary contribution (they are the second largest nationality within the NRPTT), which has strengthened the organization. He then drew attention to the fact that, on the basis of some bizarre criteria, the EU aid to Cambodia for the development of the rule of law and for the Khmer Rouge Tribunal skyrocketed from 152 million EUR for the period 2007-2013, to 410 million EUR for the period 2014-2020. Finally, speaking of future elections, Rainsy invited the Cambodian army not to open fire on citizens in the event of peaceful demonstrations taking place in Cambodia. The organization of such demonstrations is a hypothesis that Rainsy made should international pressure fail to induce Hun Sen to change policy, release Kem Sokha and restore the CNRP. It is a very unlikely prospect, Prime Minister Hun Sen has already accused Rainsy of high treason. Recently, he has even threatened the opposition leader publicly, by saying he is ready to have him taken by his men.